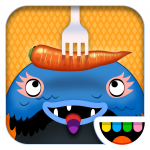 Currently free at the iTunes store, Toca Kitchen Monsters is a very popular app with kids of all ages. The app is a fun, creative game that allows kids to prepare and cook food. This is a great app to use for following directions. The app is entirely nonverbal, so language is not required. The adult playing with the child can add language to guide the child through preparing the food. We have used this app with kids between the ages of 3 and 12 years old with diagnoses of Autism and speech/language delays.